Today marks the end of our week here at King’s Mountain State Park. None of us were ready to leave. We weren’t ready to rejoin civilization. Or to wash the smell of the campfire out of our clothes. We hadn’t even had a chance to see and do all there was to see and do. There were trails we had yet to hike, water we had yet to fish, sunrises we had yet to witness. How could we possibly leave now? We couldn’t. So we didn’t. We decided to stay for another week, because sometimes you have to hold on to a good thing. A great thing. The kids are absolutely loving life. They are running and playing and throwing leaves and riding their bikes and chasing squirrels and simply being… kids. And they are sleeping like the dead at night. I am loving the fact that I can simply let them be. Oh sure, I keep my eyes on them and make sure they are being safe and staying close to home, but I don’t have to follow them around anymore. I don’t have to worry about what they put in their mouthes or up their noses. And their new-found freedom has brought me a little as well. I find that I have a little more time to read, to write, to run. To breathe. I feel as though my batteries are finally beginning to recharge. There is not a doubt in my mind that we are exactly where we need to be right now. Rob is finally ready to hit the water. We picked him up a fishing license this afternoon and realized a few seconds too late that we were in North Carolina when we bought it, not South Carolina. So tomorrow morning, as he slips out into the darkness in search of solitude, he will have to go a few miles further down the road than planned. He won’t mind, though, just so long as he is able to get a line wet. Bringing home a catfish or two would be an added bonus. Whether they are from North Carolina or South Carolina won’t make a bit of difference. So when the kids and I wake in the morning, the birds will be singing, the sun will be rising, and Rob will be fishing. And all will be right with the world. They were right. It’s the little things that matter. It’s the little things make life… remarkable. This entry was posted in Crazy Kids, Daily Life, Family Adventures, Quotes, Random Thoughts, RV Life, Travel and tagged camping, e.e.cummings, fishing, hiking trails, King's Mountain State Park, nature, RV life, South Carolina, travel. Bookmark the permalink. 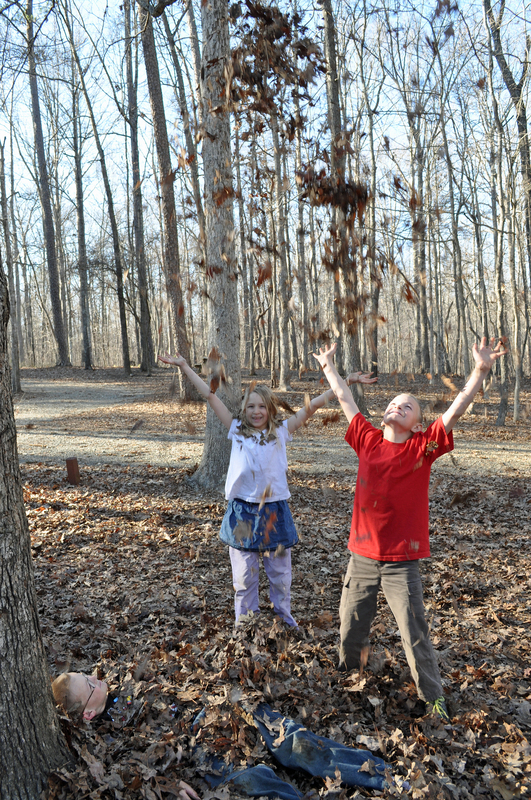 How strange it was to watch the kids play in the leaves in February! They had such a great time, though!